Martha Crone begins her 20th year as Garden Curator. 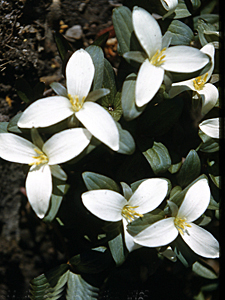 Snow Trillium (Trillium nivale), photographed in the Garden on April 19, 1952 by Martha Crone. The first Snow Trillium came out on April 14. The week of the 13 to 19 was very warm, and by April 20 the temperature was 80 degrees. Unusually warm for April as these temperatures indicate: 4/26 - 81°, 4/27 - 85°, 4/29 - 91°, 4/30 - 92°. The early plant bloom, delayed by the snow, was then accelerated by the warm weather, as the date on some of her photos indicates. Liquidambar styraciflua, Sweetgum, not native. Iris verna, Dwarf Blue Iris, not native. Clematis crispa, Swamp Leather Flower, not native. Collinsonia canadensis, Citronella, Richweed, not native. 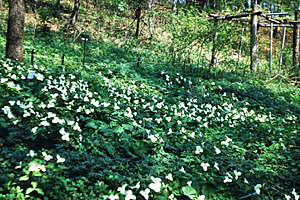 A bed of Large Flowered Trillium Trillium grandiflorum, photographed in the Garden on April 29, 1952 by Martha Crone. Click on image for larger version. Did you know that Citronella (Collinsonia canadensis) of the mint family is another plant that has many common names. Its one scientific name definitely identifies it. Some of the common names are Rich-leaf, Stone-root, Knob-root, Knob-grass, Horse-weed, Knob-week, Ox-balm, Horse-balm, and Collinson's-flower. It grows native from Quebec to Ontario south to Florida and westward. This erect branched perennial is well established in the Wild Flower Garden. The yellow, lemon-scented flowers appear in October and bloom until frost. Oil of Citronella is not derived from this plant. On May 19th the Hummingbirds returned to the Garden. The Woodland Garden with Garden Office atop the hill, photographed on May 15, 1952 by Martha Crone. Click on image for a larger version. 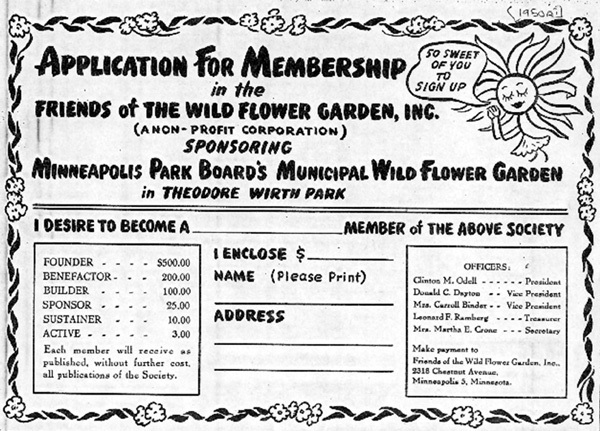 On June 18th Articles of Incorporation were filled with the State of Minnesota for The Friends of the Wild Flower Garden, Inc., a non-profit group formed for the purposes of advancing, promoting and furthering the interests of the Municipal Wild Flower Garden in Theodore Wirth Park conducted by the Board of Park Commissioners of the City of Minneapolis. The legal work of creating the articles of incorporation and the bylaws was done my Joseph Colman of the Dorsey Firm. He also handled the filing of non-profit status with the Internal Revenue Service and that status was approved in late 1953. The founding directors were Clinton M. Odell, Russell H. Bennett, Dorothy Binder, Martha E. Crone, Donald C. Dayton, Leonard F. Ramberg. 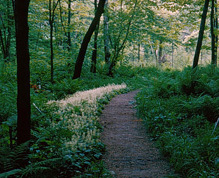 Foamflower (Tiarella cordifolia) in bloom along the path in the marsh. Photographed in the Garden on May 31, 1952 by Martha Crone. Click on image for larger version. Clinton Odell was a student of Eloise Butler and a frequent visitor to the Wild Flower Garden. When Martha Crone became curator he provided assistance to her. He felt it imperative there always be a group of citizens who would work for the best interests of the Garden. He was concerned the Garden could become expendable if the Park Board had to cut costs. His full story is found in this article: Clinton Odell. The background of the other directors is: Russell H. Bennett was Chairman of the Board of Dunwoody Institute; Dorthy Binder was a Twin Cities Journalist; Donald C. Dayton was President of the Dayton Company; Leonard F Ramberg was affiliated with the American Swedish Institute and Augsburg College where he was later Chairman of the Board of Regents. Details on those four directors HERE. 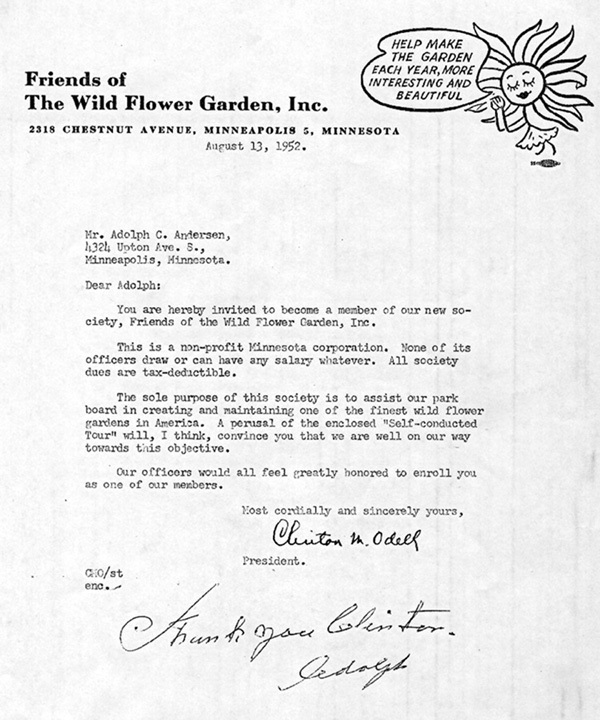 Clinton Odell wrote letters to many of his business acquaintances inviting them to become a member of the friends. Here is an example letter. An early membership form in this photo. Chrysothamnum graveolens [now Ericameria nauseosa] Rubber Rabbitbush, not native, Pavek Nursery. 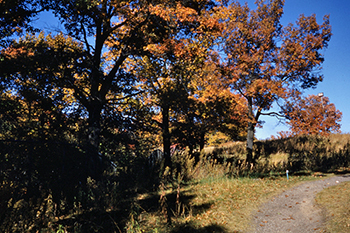 The entrance path into the Upland Garden, photographed by Martha Crone on October 17, 1952. Click on image for a larger version. In October of 1952 Martha planted several more exotic species - the first of which is a real pest and has been stubbornly eliminated. Polygonatum cuspidatum, [now Fallopia japonica var. japonica, Japanese Knotweed, not native, from Hedby Jones on Hy 101 & 7 in Minnetonka, not native and invasive. Cyprepedium passerinum, Sparrowegg Lady’s-slipper, seeds from Alaska, not native. Linaria macedonica [Linaria dalmatica subsp. macedonica] Dalmation Toadflax, introduced to the U.S. Plants from Meyers Nursery. 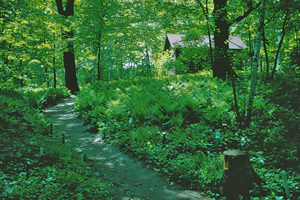 [in 1953, July 24, she planted 2 more ‘from near Duluth’ which is where the DNR has found them in their plant surveys. However, the U of M states that the subspecies found is subsp. dalmatica. On October 21 Martha wrote: "Witch Hazel on west hill came into bloom. Garden is tinder dry, no rain since last of August. Sprinklers going everywhere. Several killing frosts last week. Water pipes froze in some parks and burst, we kept faucets partly open." Twin Flower Linnea borealis. Photo ©Kitty Kohout, Wisconsin Flora. 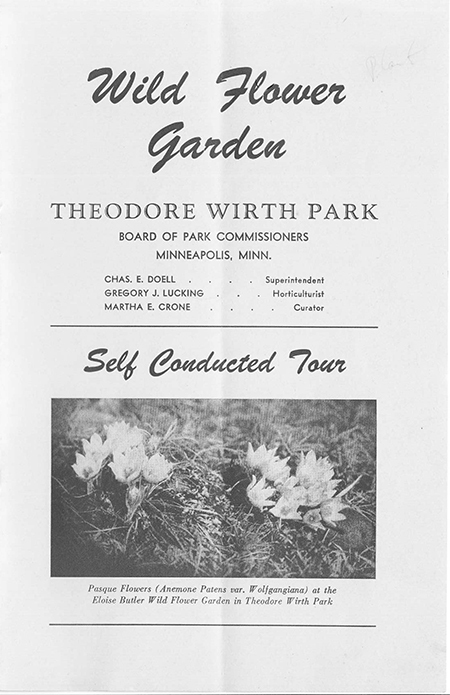 Martha Crone had produced a brochure titled “Self Conducted Tour" thru the Garden and nearly 10,000 were handed out this past year. (1) [example below] She estimated attendance at more than 50,000 persons. She also totaled her new plant count at 1,067 of which 231 were purchased and the remained sourced by Martha herself from various scrounging around. Some of those plants were the new additions noted above. The remainder were species already in the Garden. Martha was fond of starting plants from seed in the fall and a number of the plants she reports setting out in the Garden in large quantities undoubtedly came from seedlings. Even though the Garden closed on October 31, Martha was still busy planting in November. 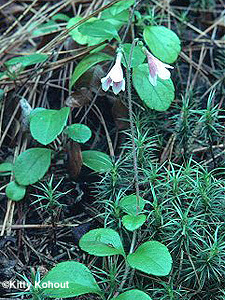 Her last entry in her log was on Nov. 17. when she logged planting 25 Twinflower, Linnea borealis, along the marsh path. During the year Clinton Odell provided the funds for another 100 aluminum plant labels, adding to those he had provided in previous years. Below: The front page of the new Self Conducted Tour brochure. It was eight pages, containing trail descriptions and a map. 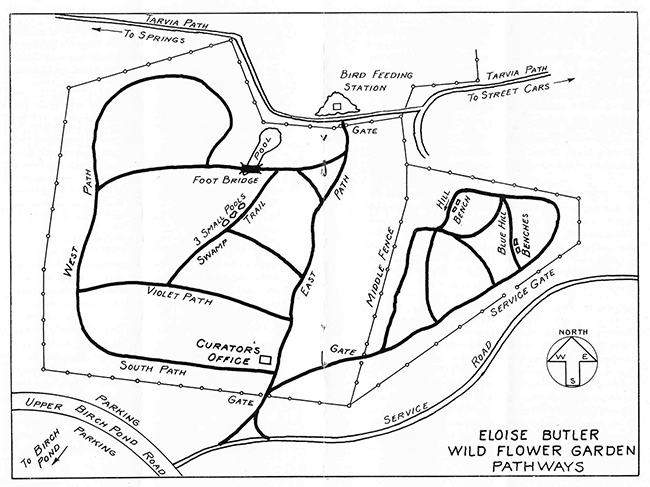 The map is shown in the 1947 history. An application for membership in The Friends was included. The brochure was printed by the Dayton Company. Donald Dayton, President of Daytons was on the Friends Board of Directors. PDF image of entire brochure. Below: Martha Crone's 1952 hand-drawn map that was part of the Tour brochure. The scale vertically is much compressed to fit the paper size. (1) Annual Reports of the Garden Curator to the Board of Park Commissioners - dated Feb, 4, 1953 to Charles E. Doell. Photo top of page: The Marsh photographed on May 15, 1952 by Martha Crone. Note the open pool of water which was one of the three new pools Martha had excavated in 1947. Click on image for the full image. Martha Crone's Annual Report to the Board of Park Commissioners dated Feb. 4, 1953 to Superintendent Charles E. Doell.